for reconsideration of that denial. If the person does not ask for reconsideration during the 30day period after the date of the denial, he or she is considered to have withdrawn the application for a medical certificate. Administrator under 49 U.S.C. 44703. 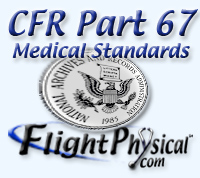 (3) By the Manager, Aeromedical Certification Division, or a Regional Flight Surgeon is considered to be a denial by the Administrator under 49 U.S.C. 44703 except where the person does not meet the standards of § 67.107(b)(3) and (c), 67.109(b), 67.113(b) and (c), 67.207(b)(3) and (c), 67.209(b), 67.213(b) and (c), 67.307(b)(3) and (c), 67.309(b), or 67.313(b) and (c), any action taken under this paragraph other than by the Federal Air Surgeon is subject to reconsideration by the Federal Air Surgeon.